We are glad and proud to introduce you another worldwide exclusive: Bicycle Prestige. 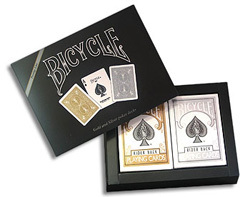 A Bicycle poker 2 – deck set, one with gold back and the other with silver back. The US Playing Card Co. accepted to produce these two amazing decks that we’ve been dreaming of for a long time. The backs of these cards are printed with gold and silver metallic inks. Just try to imagine how many color changing effects can be created thanks to these two new Bicycle decks. • Cases are golden and silver, too. • These two decks come provided with an elegant package. • The quality of the cards is the same as the regular Bicycle. • Inside each deck, you will also find a blank face card, always with golden or silver back.